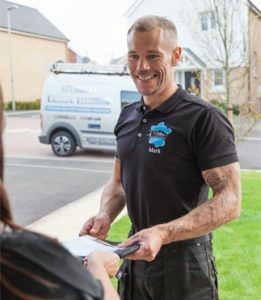 Most of our customers have had to go through a handful of window cleaners before they find a service such as ours that they can be satisfied with. That is the opinion of many of our many happy & satisfied customers. Here at Spotless we provide a more personal service. We have very high standards and we pay attention to detail. Our service speaks for itself, much of our work comes from personal recommendations. Our service includes cleaning all windows, window frames, window sills, your front door, front door frame & front door sill. When we quote any new job we will arrange a convenient time with you for us to visit. In most cases we are able to provide a quote without the customer being at home. You can request your quote here. We simply arrange a day to visit the property, with the customer leaving any gates unlocked for us to enable access to the rear of the property. Once we have our quote for you we will then let you know by the method of communication that you have chosen, be it a quote slip through your front door, or even a text message. One thing that we promise is that we will always quote you a fair price for the work that we carry out. This is a no obligation quote for you to consider at your convenience. If you wish to go ahead with your quote just let us know. We will then simply add your property to our regular schedule, at your chosen cleaning frequency of either monthly, or 2 monthly cleans. At no point do you enter into any type of contract with us, and you are free to discontinue our service at any time. Firstly and above all this is down to courtesy, as you are notified of our arrival prior to us carrying out our service. Secondly, this also allows you to leave any gates unlocked for us to access your property. Once our service is complete we will always make sure that your gates are fully closed and secure before we leave. before, such as air vents, so that your windows & frames are squeaky clean. When cleaning your windows we will always clean your window frames as well as the sills as standard. This keeps your windows, window frames & window sills looking nice and clean. Having clean window frames also stops your windows from becoming dirty when it rains. We then move on to your front door and front door frame. We remove any cobwebs from your entrance, and all dirt/dust from your door. As the most used door at your property, and the first point of contact for visitors to your house, we think that a clean front door and entrance is very important. If you would like your whole entrance cleaned & maintained just let us know and we will give you a quote for this service. We always finish off with a personal touch by wiping your window sills and your front door sill with a cloth so that they shine. Once we have finished our service we make a final inspection of all the windows, frames, sills and front door so that you will be happy with our service, and at that point we give you our satisfaction guarantee, where in the unlikely circumstance where you are not completely satisfied with anything we have done we will visit again to continue until you are satisfied. Once we have completed our service, we make a final inspection and secure any gates. We will then post a slip through your door. On this slip will be details of how to pay your bill. If you use online banking then you can set us up as a ‘Payee’ under ‘Window Cleaner.’ For those who wish to pay by debit card you can use our online payment portal on our website under ‘pay my bill’. This option is secure and at no point are your details shared with us. Sometime customers prefer to pay with cash. This is fine to do on the day if you are in. If you are going to be out, then simply reply to our courtesy text message with the location of your safe place that you have left cash, such as under a plant pot or under a door mat. Once we have collected your cash payment from your safe place we will immediately send you a text message to confirm receipt of your payment. Why not add our internal Window Cleaning service at the same time?